The Missing Edge You Need To Catch Breakouts Like A Pro. Follow a step-by-step system that detects the most powerful breakouts! Discover market patterns that generate massive rewards based on a proven and tested strategy. Have access to the game changing indicator that will take your trading to the next level! Execute your trades in 3 Easy Steps! 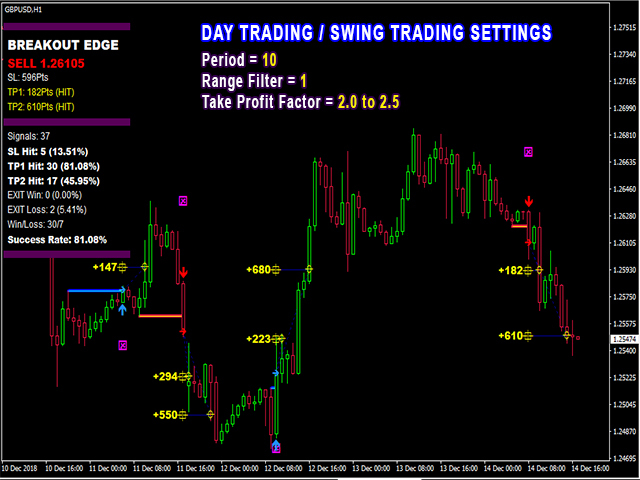 Option 1: Recent Swing - Stop loss calculated by the indicator. Option 3: Take profit on opposite signal to maximize strong breakouts. Unique price action based algorithm. Powerful combination to any trading strategy. Auto-detects entry, exit, stop loss & take profit levels. Reliable data that will give you the confidence to execute your trades. 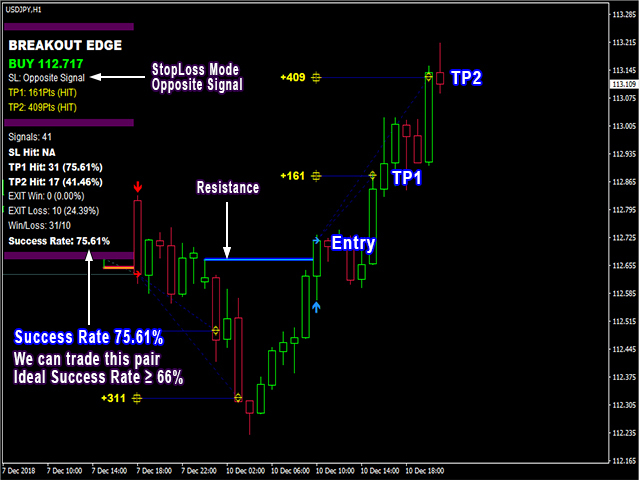 TP1 Hit - When a signal reaches at least TP1. EXIT Win - When a trade is closed on opposite signal and resulted to a positive profit. 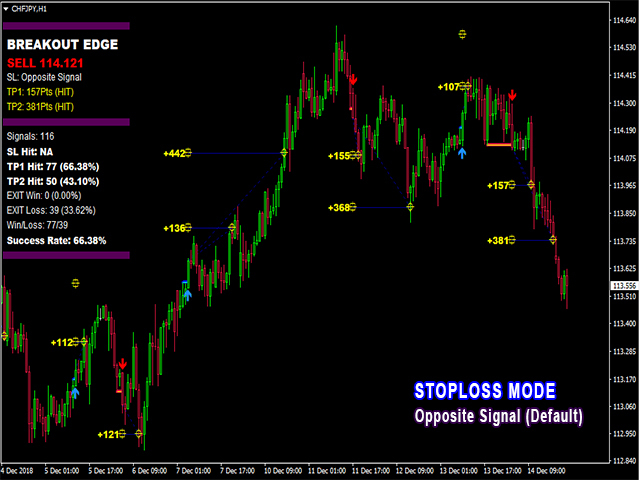 SL Hit - when a signal reaches Stop Loss. Exit Loss - When trade is closed on the opposite signal and resulted to a negative profit. Used as reference to find better pairs and timeframes. Period - the number of bars used to calculate the algorithm. Range Filter - the factor used to filter ranging markets. 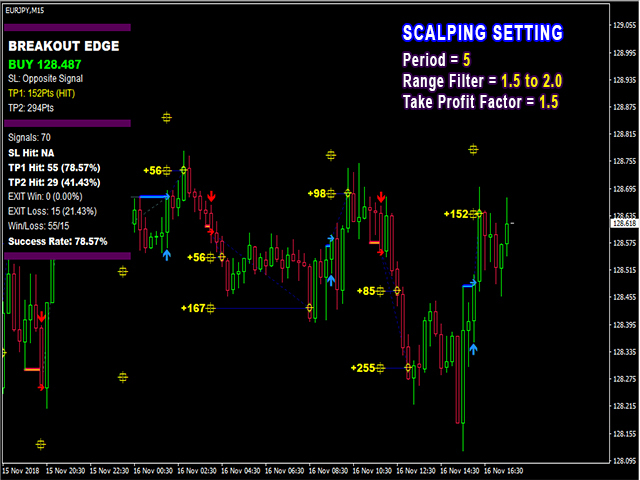 Target Factor - the multiplier used to calculate take profit levels. Misc Parameters - controls the universal visibility of objects and buffers. Display Parameters - controls the visibility of objects drawn on chart. Graphics Parameters - controls the appearance and colors of drawn objects on chart. Dashboard Parameters - controls the visibility and colors of statistics found on chart. Alert Parameters - controls the alert options enabled. Offers solutions to different trading styles. Very useful product and easy to follow/setup. Combined with my trading strategy - very good to catch those breakout! My first test in the live account was successful and profitable. The support is great. With a little practice, the profits can be maximized. good work! Every single product released by this developer is accurately measured and provides for solid risk management tooling. Great product. Look forward to long time use. This indicator allows me to get in the market early - hint: trade with the Trend and even improve the success rate more!! Pipfinite providing another great tool for my arsenal. Very helpful indicator , great work! This is a great Indicator. Gives you lots of winning trades. Great indicator, I use it on the higher time frames and am impressed with the results. Great indicator and great support! Thx! THIS IS THE MOST PROFITABLE INDICATOR!! IT IS AMAZING.!! HOW COME U MAKE THIS KIND OF THING! There IS a reason why the "Breakout Edge" and "Trend Pro" indicators have 5 stars. And is not for the really great cost/benefit you get for renting the indicator for one year, which reeeally makes things easy for you and your trading technique; although I would say is sad it is sad you can't buy it per se, it end up being one huge bag for your buck in comparison to other professional indicators learning institutions might charge you for *cough* IML *cough*. I kept on looking. This is my fourth week since I officially started trading, and while looking for an EA I found this beaty. Well, at first I found Trend Pro. I was really excited to find something that could help and add to my technique. Specially since I had burnt my own account two weeks ago for falling sleep without using SL, and my signal provider burning my other account -_-. When I saw Pipfinite had a 4 products in total, I sent them an email to avoid purchasing the wrong thing for me. Their customer service is awesome! Period and exclamation point haha. They explained to me the differences, warned me about this being an indicator and its success rate being intrinsic to the person using it. They advised me to try their demo and to monkey around with the parameters to find the right ones for my technique before purchasing. I did the demo on the currencies I am familiarizing with different settings (they are all in the manual). And sooner than later I decided that it was the indicator for me and my technique. I am happy to say that in the few hours I have been using it, it has already provided me with profitable and confident signals! (for me at least). And that is not even using the scanner, which I would like to solicit it now so I could surf different markets at the same time ;’) ❤. Man, we are truly living in a wonderful time xD. The millennial way to trade here guys! A very useful Tool. Thank you for that. Great product so far. Loving it. Keep up the good work. Interesting as an additional indi for a existing system i.e. eben gekauft ... installiere und Teste, Vielen Dank! looking forward using my new indicator. I'm confident, it will live-up to expectations. good product. I got it. This indicator looks very promising. Thanks! Very nice and simple inidicator with good profit! Another good product from PipFinite, highly recommended!!!!! Another great product from this developer, I think this may just be my favorite, I love the fact that it gives useful performance statistics. Thank you for this great indicator. You have outdone yourself once again young lady. Keep it up. 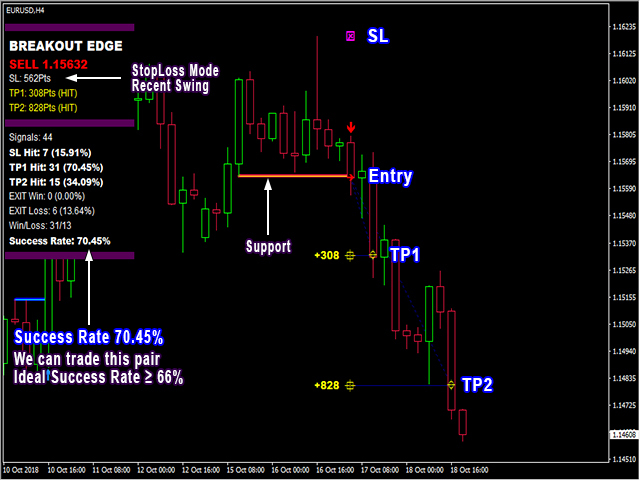 First trade I made with this indicator by plugging in the suggested settings hit TP1 and TP2. Caught 18.9 PIPS. My lot size was 1.00 you can do the math and see what was my total return. Paid for the indicator and profited on the first trade. I have been a loyal customer since the original breakout analyzer and trendpro and I must say these guys know what they are doing. Amazing product. I had my friend buy it as well. 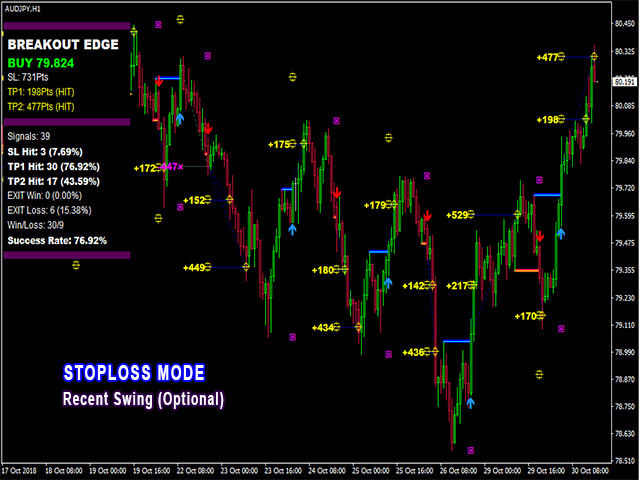 I have found this strategy to complete in full the new trading system that takes into account every market movement. Just bought Trend Pro, Reversal and Breakout. Starting to fight with big expectations! Another good one, keep up the great work!